Accounts are produced weekly during current week .Our preferred method of payment is through automatic payment or internet banking however you may pay by cheque or cash if this suits. Failure to abide by this will result in your child’s booking to be cancelled. We do charge for public holidays if your child normally attends on a day that falls on a public holiday this day will be charged on your account. Please notify us if your child will be absent. Late Fee:There is a late fee of $2.00 per minute after 5.30pm as it breaks our Ministry of Education license to have children on the premises after 5.30pm and this could result in a fine. 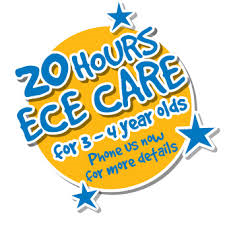 Children collected later than their contracted time and prior to 5.30pm will be charged at the hourly rate for extra time. All casual bookings made are subject to charge unless cancelled with a minimum of 24hrs notice. Full Fees are charged for all absences.